Far more than old stone face himself, it was Mega City 1 itself that caught my imagination as a child reading 2000AD. There’s something both thrilling and terrifying in the idea of this vast, anarchic, dirty, futuristic, but recognisably human place. Comprising all the major urban conurbations of the US Eastern Seaboard, from Boston, through New York, to Washington, if real, this place would be a megalopolis on an almost unimaginable huge scale, clinging on to existence as a kind of cancerous outgrowth built on the ruins of the ‘old world’ but now home to some 800,000,000 people. 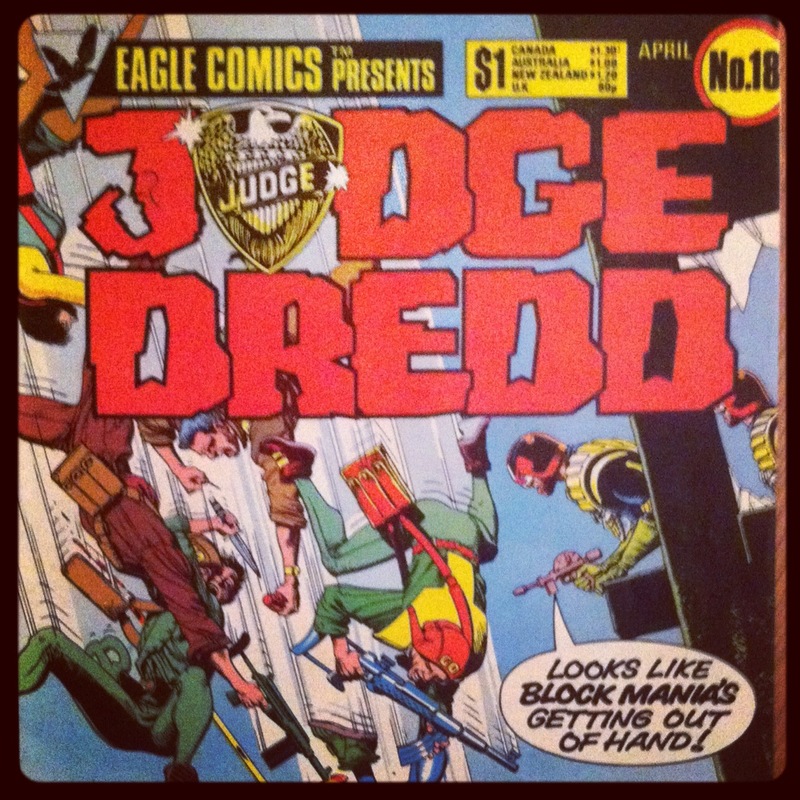 A couple of weeks ago I went to see Dredd at the cinema. Fans of 2000 AD must be breathing sighs of relief as it’s a marked improvement on Stallone’s risible – helmetless, for Drokk’s sake – 1995 attempt. The new 3D version isn’t perfect but, aside from some so-so dialogue it’s a pretty good effort. For a film that’s mostly set within a gigantic tower block, it’s visually impressive, with a plausible balance between futuristic hi-tech and lived-in urban grime. There are one or two irritating moments, where various baddies have Anderson or Dredd just where they want them, but pause to make a Bond-villain-esque speech, just long enough for their beaten and bloodied captives to wriggle free and blast their way out of trouble. The cast is very good on the whole though: Karl Urban makes a sound fist of playing Old Stoney Face, while Olivia Thirlby as rookie Psi Judge Anderson and Lena Headley playing the villain of the piece make the most of the script. The excellent Wood Harris – Avon Barksdale from The Wire – even turns up as, you guessed it, a drug-dealing gangster. 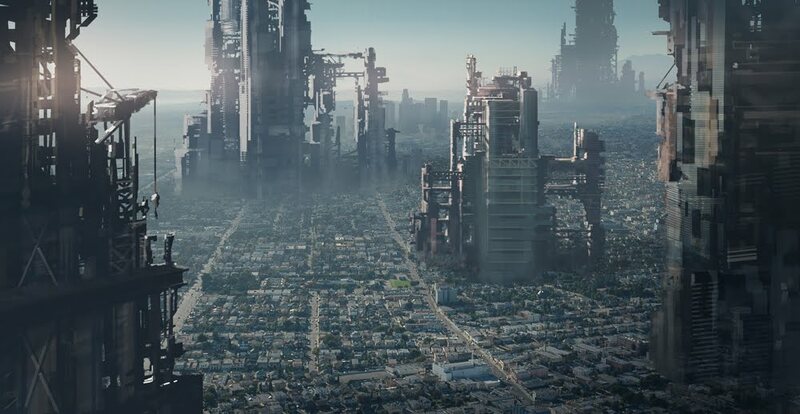 One of the film’s opening shots shows a satellite style view of Earth, overlooking Mega City 1 in all its crumbling immensity, giving a brief teasing glimpse of the sheer epic scale of the place. A part of me longed to explore its streets, whilst another wished to turn away in horror. It’s hard to fathom a city that big, in population terms dwarfing the likes of Shanghai, Istanbul, Delhi, Mexico and Beijing and with buildings massively bigger and taller than the tower blocks of New York, Tokyo, LA and Sao Paolo. I can’t help wondering – to paraphrase Richard Scarry – what, in such an environment, would people do all day? In Dredd’s world they get into trouble, causing it or finding themselves on the receiving end of it. Almost everyone is regarded by the Judges not as individuals, but as little more than an amorphous mass of would-be Perps, bound for death or the Iso-cubes. Every so often a 2000AD story would explore the lives of the citizens, through an individual such as Marlon Shakespeare – a typical Juve with no job, prospects or future to look forward to. He found a way to assert his individuality by becoming Chopper the city’s most celebrated ‘Scrawler’ (grafitti artist). Eventually of course he was arrested by the Judges. (The film makes a brief reference to Chopper with a shot of his tag on a wall – along with a nod to another unfortunate citizen from the comic – Kenny Who?). Is this kind of anonymous, ant-like existence within an almost continuous sprawl of urban streets what most of the world’s population will be faced with in the future? This is city as nightmare. A hideously cramped, crime-ridden, gridlocked and polluted mass of people. Green space vanished forever, employment only for the very few, with everyone else fighting it out as best they can, surviving somehow in Mega-Blocks the size of cities themselves – John Webster’s “suburbs of hell”. The development of a Mega City is one potential future I suppose, but I can’t help thinking that the growth of such a place is unlikely. It’s surprisingly common throughout history to see cities destroyed or abandoned for all manner of reasons. Wikipedia has a page listing dozens of famous and not-so famous ‘Lost Cities‘ from Tanis and Memphis, former capitals of Ancient Egypt, to England’s Dunwich lost to the sea and Ukraine’s irradiated Cherynobyl. Most of the cities on this list were at one time or another thriving urban centres before, one day, they were gone. Recently on Orkney archaeologists have discovered evidence of a gigantic temple, built by Neolithic man, long before the Egyptians began constructing the pyramids. Built on a spit of land called the Ness of Brodgar, the complexity and sheer size of this edifice – it covers more than six acres – has turned previous ideas about prehistoric civilisation in Britain on their head. Rather than the southern downlands of Stonehenge and Avebury, it seems the cultural life of ancient Britain centred on the far north. The incredible discovery on the Orkneys is further evidence that cities and civilisations, however successful or large in scale, continually rise and fall. This isn’t a phenomenon confined to prehistoric sites either. Even cities in otherwise successful, prosperous countries, unthreatened by immediate environmental dangers, war or disease, can descend into rapid decline – just take a look at photos of downtown Detroit, or Gary, Indiana to see how quickly entropy sets in once the money runs out and the jobs are gone. Yves Marchand and Romain Meffre’s images in Ruins of Detroit make sobering viewing. Fascinating and appalling the thought of a city on the scale of Dredd’s may be, I think it’s far more likely that explorers in the far future stumbling their way across the post-apocalyptic remains of North America will find ruins akin to Shelly’s Ozymandias, rather than a Mega City. Even if I’m wrong, the real-world equivalents of Dredd will simply arrest them for trespassing and consign them to the cubes. Very nicely done old chum. Glad you enjoyed the film as well. Intentional. Bit of a formatting error. Shard pic is there for illustrative purposes.